Children’s reading is growing! Last week my preschool children began to read independently. It was wonderful. The photo of children on the rug with their books spoke to the power of reading aloud good books, and children modeling what they love. 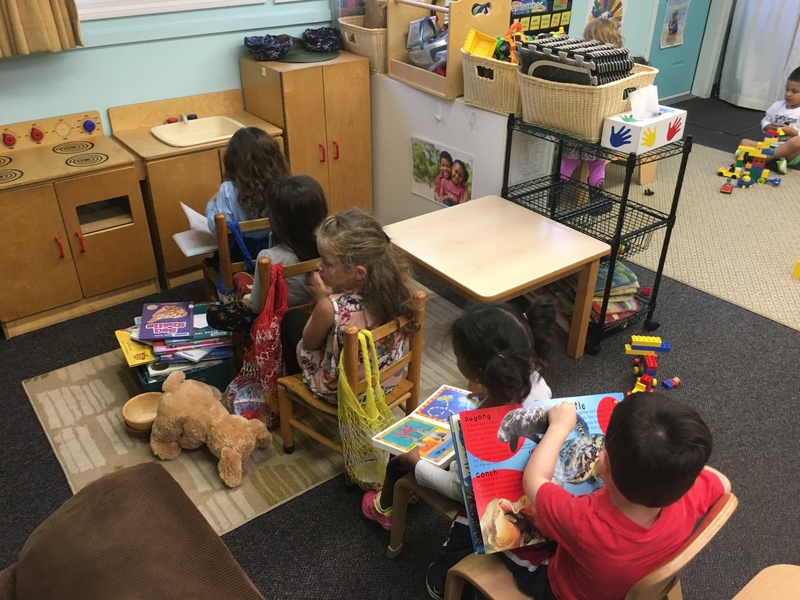 Children decided to line up the chairs like a train, with every child reading a book. Teachers stood back and smiled, watching all that was happening. All aboard! This entry was posted in books, children's books, Early Education, Imagination, Inspiration, picture books, reading, Teaching young children and tagged books, children's books, Early Education, Independent reading, literacy, picture books, reading aloud, teaching young children. Bookmark the permalink. I love that, John. Thank you! I love what you are doing, Jennie! So imaginative! I totally believe that being involved with the books in more than just the reading will help them to learn to read with more understanding because they are actively involved in making choices that will help that process. Thanks so much, Anne. I will email you soon. Mine is sfitzkee@erols.com. Off to work. Yes, indeed! Best to you, Pete. All aboard for a rich life of imagination and wonder! I think you are absolutely right! Thank you, Annika. How delightful, Jennie. All aboard the reading train! Hurrah for inspiring/instilling a love of reading in these small human beings! Easy to forget that reading is a relatively recent human creation/development… so magical that small shapes on a page can be interpreted and translated into images, stories, ideas in our minds!!! Two of my favorite things, reading and trains. So fun to see them grow. And you know they’re two of my favorites as well. You can imagine how wonderful it was to see children doing reading on a train. Thank you, Dan. All aboard the reading train! Woot! I’m so glad you had your camera handy, Jennie. I love this photo. Have a thriving Thursday. Hugs. My grandson is being tested for autism, he has a lovely teacher but still doesn’t like school. I think he would really love your class, Jennie, as he loves books and you seem to bring the stories alive for the children. But it’s more than likely he doesn’t like the confinement of the classroom as he is fine in the playground. His neighbours are farmers and he helps them with the animals and milking the cows, I can see him as a farmer himself in the future. Thank you so much, Jean. How old is your grandson? I’m a firm believer that any child age 3 and early 4 (especially boys) feels confined in a classroom and does/learns better outdoors. Not liking school might be something different. Is the teacher structured or formal? Do they have to sit in chairs? Do they get to move, meaning music or movement? I worry because the number of children who are diagnosed with autism is off the charts, and it is directly proportionate to physical activity. What boy wouldn’t want to be a farmer with animals! He has a special cushion that moves with him and he can use those little gadgets called figits in class. His attention span is not great but he has a personal teacher’s aide to help him as does another boy in the class, which makes a big difference. That’s wonderful news, Jean. And how old is he, years plus months? For example, a child who is 3.1 (three years, one month) is a far cry from a child who is 3.10 (three years, ten months). So, when a parent says their child is three, that is a very broad developmental range. He will be nine end of this December. How amazing, Jennie. You have a magic wand. That’s so nice, Robbie. Thank you! We can learn so much from children…..
My 15-month old friend, has loved books since before birth!! A book is her favorite go-to! It is amazing! Ever since she started crawling, she will bring me a book, turn the pages, point to the pictures and say her new words for me… she’s so very proud of her accomplishments. And she is reading!!! She LOVES books! Did I mention that already? That is awesome, Ren! And yes, we can learn so much from children. How fun and creative of them to think of this for the reading time! You have given them the freedom to read and have fun in your classroom.